"How do we tell our kids about the true meaning of Easter without scaring them?" That was the question, Steve Mercer, PBF's Associate Pastor of Children and Families, tried to answer last week. Note: If you are part of our PBF MOPS group and would like to hear this talk in its entirety, please visit our Facebook group to playback the live stream. The story of Christ's death is gruesome. The beatings, the humiliation, the thorns and nails followed by tortuous death. Sharing that with our kids, even in a glossed over form, feels like we are stripping away their innocence. Yet, this is a story that our kids need to know. Christ's death and resurrection are our hope. His love for us, which brought Him from heaven to Earth for the purpose of this sacrifice, is what gives our lives meaning and belonging. Our children need to know the story. 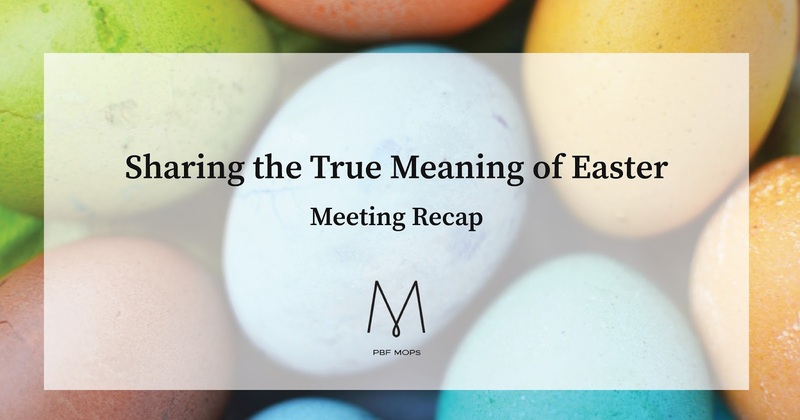 Steve shared that when it comes to the story of Easter, it is only as graphic as we make it. The depth of detail depends on the age and readiness of each child. When sharing the story of Easter with our children, Steve encouraged us to start at the beginning but keep it simple. To share how Jesus created us and loved us from the very beginning. That, someone, told a lie and that lie broke the relationship between Jesus and people. It doesn't matter how good people have been or how hard they have tried, people couldn't fix the broken relationship. Only Jesus could. Jesus came down to Earth as a baby, like we celebrate at Christmas, and when he was all grown up He fixed the broken relationship by paying the price for the lie and our sins through His death. The really special thing about Jesus's death is that He didn't stay dead. On Sunday morning he rose from the grave, proving that the relationship between people and Jesus had been fixed. Steve encouraged us not to stress about using the using all the proper theologic terms or explaining them to our young kids this year. The most important thing is that we share the true meaning of Easter with our kids. As we share, we lay the foundation of their belief system. Year after year of sharing grows that foundation and our children begin to internalize the message. The story of Christ's death will no longer be just a story to them, but part of their story. Our children might ask questions about Jesus's death and resurrection. Steve suggested we answer as honestly as we can. However, if we feel that the child is not emotionally ready to hear the answer, instead of saying, "You aren't old enough." or "I'll tell you when you are older" liken the answer to a suitcase. A child can handle a child-sized suitcase but struggles to carry an adult one because the burden is too big. It was not meant for them. Sometimes, answers to difficult questions are like adult-sized suitcases. Too big for children to carry. We only share enough that they can carry. Even with the child-sized suitcase of answers about the true meaning of Easter, our children are still learning and growing in their knowledge of the love of God for them. For more practical ideas on how to celebrate the true meaning of Easter at your house this year, visit our Spring Time/Easter board on Pinterest.